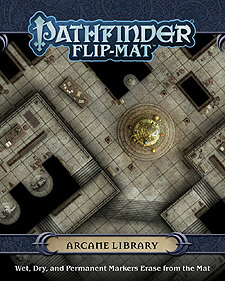 Brave the secrets of the stacks with Pathfinder Flip-Mat: Arcane Library. Each side of the Flip-Mat features a view of an ancient, mysterious trove of knowledge. One side displays a vast and complex library of arcane tomes, complete with study areas and other displays, while the other shows a series of magically separated practice and experimental spaces. This portable, affordable map measures 24" x 30" unfolded, and 8" x 20" folded. Designed for experienced GMs and novices alike, and usable with both dry erase and wet erase markers, Pathfinder Flip-Mats fit perfectly into any Game Master's arsenal! Get to the game faster with Pathfinder Flip-Mat: Arcane Library, and be ready next time your players seek out dangerous knowledge!